This latest Riley Donovan mystery takes Riley to a small town that doesn’t want to accept an immigrant farmer. When Riley and her aunt Ginny move to a small town so the latter can begin her career as a police detective, Riley meets their neighbor, Mr. Goran, a Kurd. 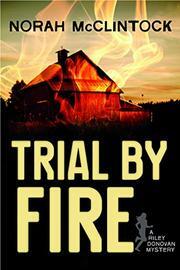 One night Riley sees a glow and runs to his farm to find his barn on fire and Mr. Goran trapped inside. He barely survives, but the police identify the fire as arson and name Mr. Goran as the chief suspect. While his father is in the hospital, his son arrives. Riley tries to help by selling the Gorans’ produce at the farmers market, but a local boy and his friends trash their stall, and the bystanders all claim to have seen nothing. Despite the hostility of the townsfolk, Riley remains certain that Mr. Goran could not be guilty and tries to find out who might be the real culprit. She faces plenty of opposition, including from her aunt, who wants to keep her out of trouble. Interestingly, McClintock does not overtly accuse the townspeople of bigotry, focusing their anger on the fact that Mr. Goran bought the farm at an auction that the town had conspired to win for the previous owner. The mystery unfolds in standard fashion, with a hint of possible romance for Riley.